Hilary Davidson is familiar to all DoSomeDamage readers, no doubt. If, for whatever reason, you don’t know from Hilary, check out her Official Bio Page of Biography. She’s written guidebooks and novels, all the while working on short stories. Now she’s collected the best of the short stories in THE BLACK WIDOW CLUB. Over the past three or four years, she’s been nice enough to answer 163 of my questions. I pressed my luck and asked her a few more about this new book, which you can buy right now. Out of all you’ve written, why collect these stories? I resisted the idea of putting a collection together for a long time, because I figured my stories were easily available online. I put up a short fiction page on my website a long time ago, with links to various places that published my work. But a number of those sites pulled down their archives — or disappeared completely — and I started to get emails from people asking where they could find stories like “Insatiable,” which won a Spinetingler Award in 2010. So the push came from necessity. I realized that most of my early stories were homeless. What makes them such a good collection? From my perspective, it was interesting to go back and examine the twisted path I’ve traveled. From a reader’s perspective, that twisted path includes stories told in wildly different voices. THE BLACK WIDOW CLUB is a diverse collection, and yet there’s a thread of betrayal that courses through each story. I’m interested in how people’s most intimate bonds can be used against them. Since readers had been asking about different stories, I decided to crowdsource the lineup. I wanted to get a sense whether the stories I liked best resonated with other people, so I asked on Facebook and Twitter what readers would like to see in a collection. There were several stories that people mentioned over and over. One that people were passionate about was “The Black Widow Club,” which first appeared in Needle. That story ended up giving the collection its name. Most of the stories that people recommended ended up in the book. The ones that didn’t were recently published, and I felt that they were easily available. Aside from the vanished-archives issue, I wanted to get people ready for my next book, BLOOD ALWAYS TELLS. It’s my fourth novel but my first stand-alone, and it’s a big departure from my Lily Moore novels. I hope readers who enjoy that series will still embrace it, and I thought I should get them ready by reading my short stories. If you’re scared off by my short stories, you aren’t ready to read BLOOD. Putting these stories together, how did you feel about the opportunity to go back in and mess around a bit with each of them? Not really. I considered doing that, but in the end I pretty much left the stories as they were. I did find typos as I read them over, and I corrected those. How do you balance short fiction with novels? How do you say ‘no’ to story requests from anthos and mags? I write short fiction between drafts of novels. I love doing that, because I’ve always got ideas for stories dancing in my head, and I can finally write one or two or maybe even three between, say, the first and second drafts of a novel. Thinking about other characters, their histories and their voices, gives me perspective and lets me come back to my book with a clear head. Sometimes I get strange requests. I’ve had editors ask if I had “anything lying around” that they could publish. Unless they want to publish dustbunnies, the answer is always no. I write my short stories the same way I write my novels. I wish I had an inventory of stories sitting around, but I don’t. I have no problem saying no to most requests. The exception is charity anthologies for a good cause. Sometimes I’m mired in a novel and I just can’t tear myself away to write a new story, even though I want to. But I will try my damnedest to do it. I just finished a story for an anthology to benefit the Wounded Warrior Project. It’s Joe Clifford’s brainchild, and the book — BADLANDS: TROUBLE IN THE HEARTLAND — will be out from Zelmer Pulp by the end of the year. Do you find yourself putting more weight into your sentences and images when you write short stories instead of a novel? Having read most of your stories and your novels, I get the sense that the novel has more of an open feel. With short stories, a writer has so little time to rope readers into their world that you can’t waste a word. With a novel, there’s more trust that you build over time. Crazy as it sounds, a novel is more like a relationship, while short stories are a one-night stand. 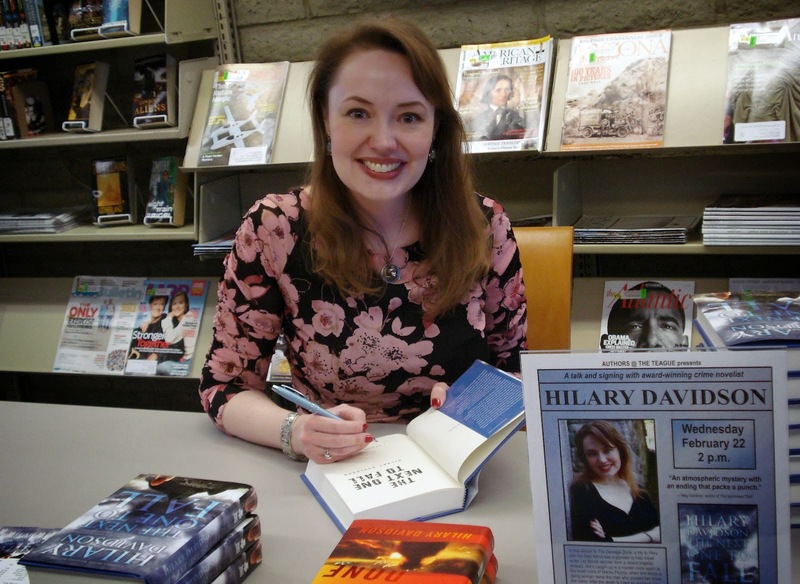 Thanks to Hilary for taking the time to talk about THE BLACK WIDOW CLUB. "Crazy as it sounds, a novel is more like a relationship, while short stories are a one-night stand." So, what she's saying here is, buying this collection is like having a series of one-night stands with Hilary Davidson. This might be the greatest marketing ploy in history. I’m Trying Not to Scare You. Really.